6 miles from Reading, 4 miles from Wokingham, and 10 from Basingstoke. 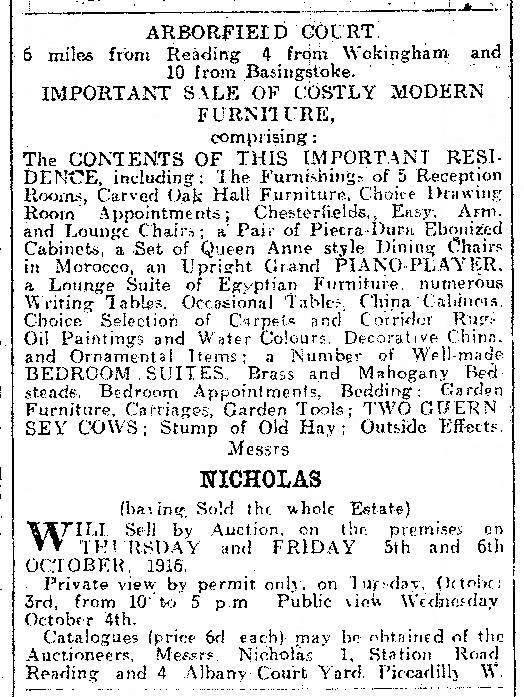 Will Sell by Auction, on the premises, on THURSDAY and FRIDAY, 5th and 6th OCTOBER, 1916. Private view by permit only, on Tuesday, October 3rd, from 10 to 5 p.m. Public view Wednesday, October 4th. Catalogues (price 6d. 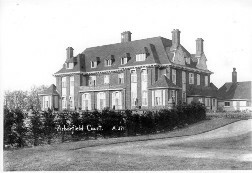 each) may be obtained of the Auctioneers, Messrs. Nicholas, 1, Station Road, Reading, and 4, Albany Court Yard, Piccadilly, W.
well over 250 acres of park and farm lands. Mrs. Bruce had sold the property to Mr. and Mrs. Prescott, who were soon getting involved in village life. All three were at the funeral of Mrs. Hargreaves in 1917.